Explore the undiscovered riches of a lost civilization! Be careful though, as navigating through the traps and tricks designed to guard this treasure won't be an easy task. If you have what it takes to survive this perilous quest then get ready for life-changing prizes! Hidden Riches is a 5 reel game that features 25 lines jam packed with adventure and excitement. The game allows for players of all levels and budgets as you can place bets from as low as one cent to $125. Look out for the adventurer symbol which is the wild card and the tablet scatter symbol. This game also features a handy autoplay feature for those who want to move the game along at a faster pace. Plunder Ancient Treasures and Boost Your Bank Account. Play Hidden Treasures Now! Enter this Indiana Jones themed game in search for Hidden Riches. Come and join the quest for riches that have been kept hidden for years. Simply follow the adventurers and they will lead the way right where the treasure lies. 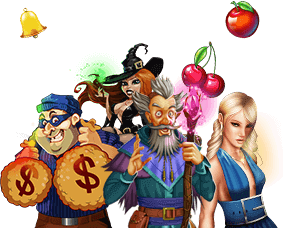 Hidden Riches is an adventure filled five real slot machine that comes loaded with amazing payouts, free games and a massive Progressive Jackpot. Hidden Riches slot machine is played at a maximum 25 lines and a max bet per line of $5. You may spin the reels by simply pressing the Spin button or you can have the game spin the reels for you by using the Autoplay feature. The "Adventurer" serves as a wild icon, substituting for any other symbol in a winning combination except scattered "Tablets". Prizes are doubled every time the "Adventurer" occurs in a winning combination. Three or more "Adventurers" appearing anywhere will award up to 25 free games during which prizes are tripled. If you're still unsure about how the game works, make sure to practice with fun money beforehand on our free slots section. Three or more scattered "Tablets" appearing anywhere will trigger the Mystery Prize. The Mystery Prize will award up to 2000 the triggering bet. Hidden Riches Jackpot is triggered totally at random, regardless of the amount wagered. Be prepared to play for a long period of time to see results. Set aside a bankroll you can do without and do not exceed when you have played it all. Know when to stop. Stopping at the right time can make the difference between having a great time and losing lots of money. Substitute: the substitute icon serves as a wild symbol substituting for any other symbol in a winning combination except scatters. Scatter: three or more scattered symbols appearing anywhere will trigger the Bonus Feature. Progressive Jackpot: the Progressive Jackpot is triggered at random regardless of the amount wagered.